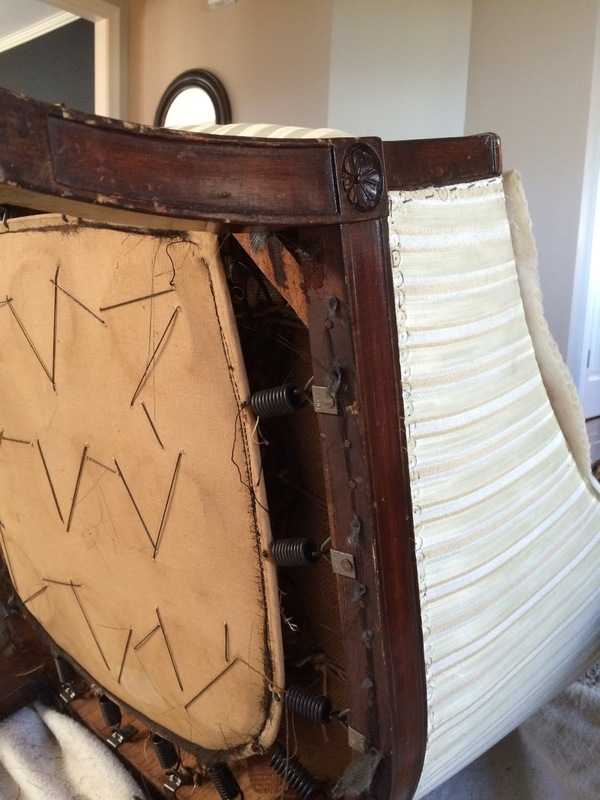 Let me start by saying that I am not an upholsterer. 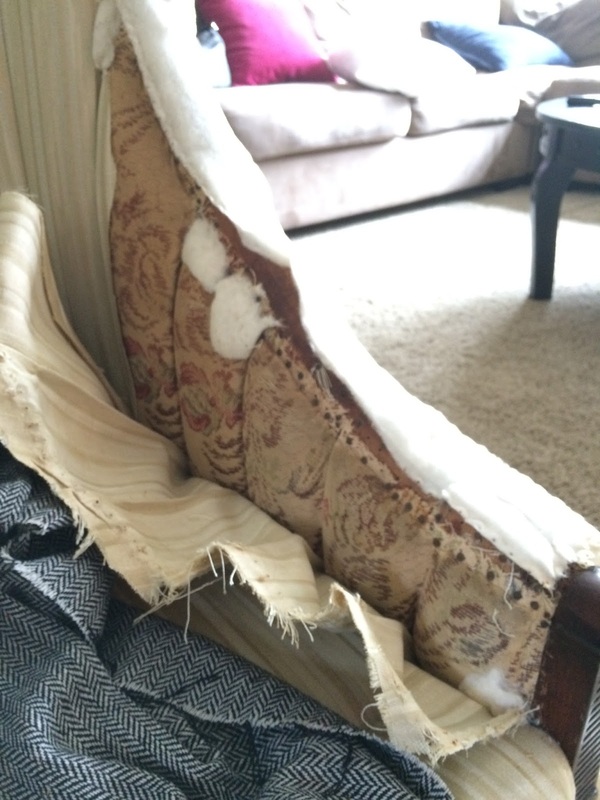 My Mom is an actual trained upholsterer, and I realize now that it is a learned craft. I wish every day that I had watched and learned from her instead of rolling my eyes and acting all bratty. The woman is a wealth of knowledge and skills, and I'm happy to learn from her, even if the lessons take place over an iPad, and she laughs and laughs and laughs at my questions. I scored this channel back chair from my neighbor, for free. My neighbor knows I love to update furniture, and asked if I do upholstery work. 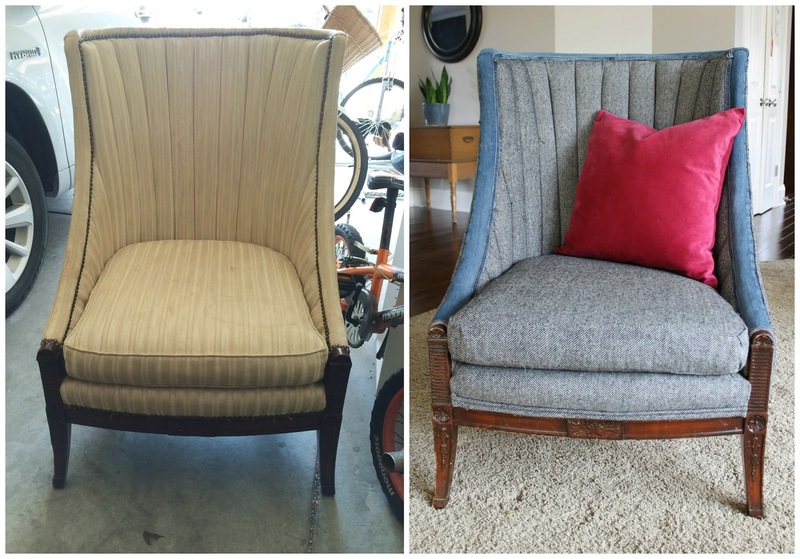 The truth is that I like to dabble in upholstery, but I learn from each new piece. The learning curve is extreme. This one was a doozy. When she said I could take the chair, I literally picked it up and ran with it to my house. More accurately, I hobbled, because the chair is heavier than it looks. It is a solid piece of antique goodness. 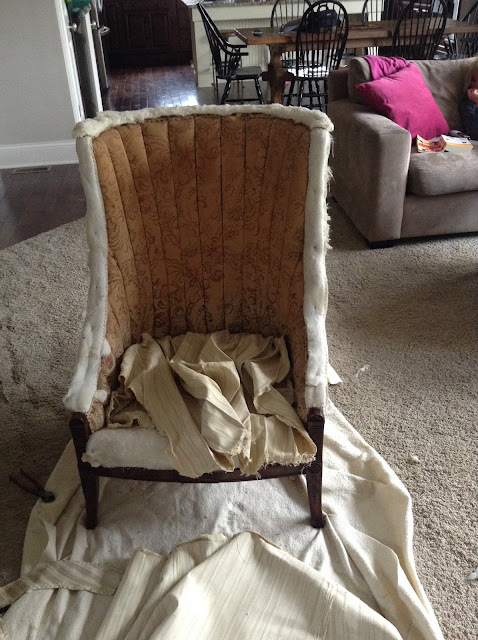 After staring at the chair in our living room, wondering how to work with channels, and asking myself what materials would suit the chair, I decided to dig in and tear it down. I thought about eliminating the channels by filling in the grooves and adding padding, but that would be a crime. The channels add to the charm and beauty of the chair. 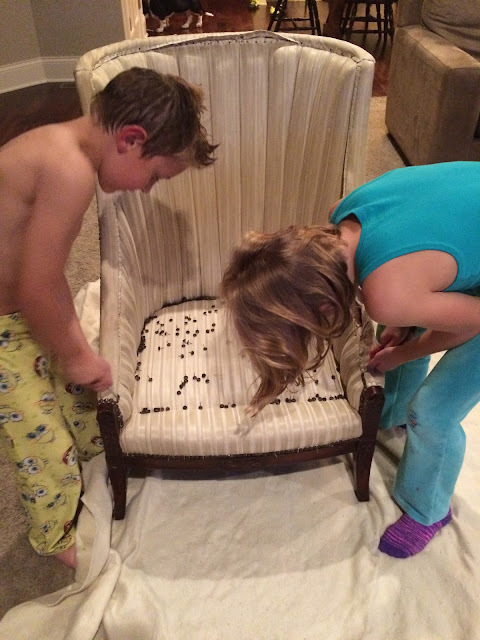 The brass nail heads popped out easily, and my kids quickly took over the tear-down. They literally took the tools out of my hands and insisted on removing every last nail head. Then came the tiny tacks and staples. I'd love to know how old it is. There are no tags or maker's marks, so it may remain a mystery. When I tipped it over, I knew I was dealing with an animal I had never encountered. There was no way to remove the cushion. So how do I get down in there with the new fabric? Here's how: you remove all of the fabric on the back, which allows access to the bottom cushion. Then you pull and staple...pull and staple. The mantra of upholstery. 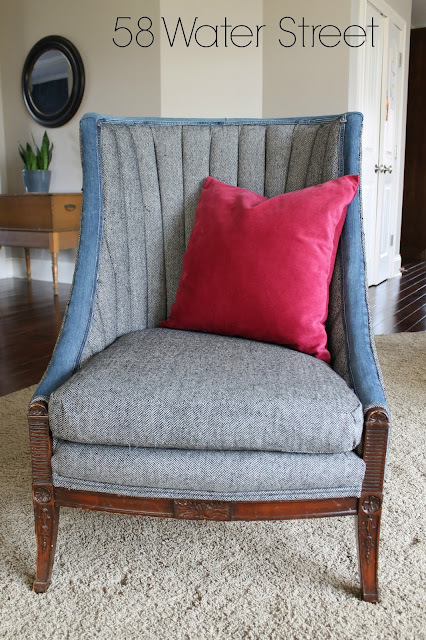 I used denim for the area under the cushion, because the herringbone fabric was expensive, so why use it where you can't see it? I decided not to tackle the channels from scratch, because I don't have the aluminum tubes or the desire to deal with that whole process. 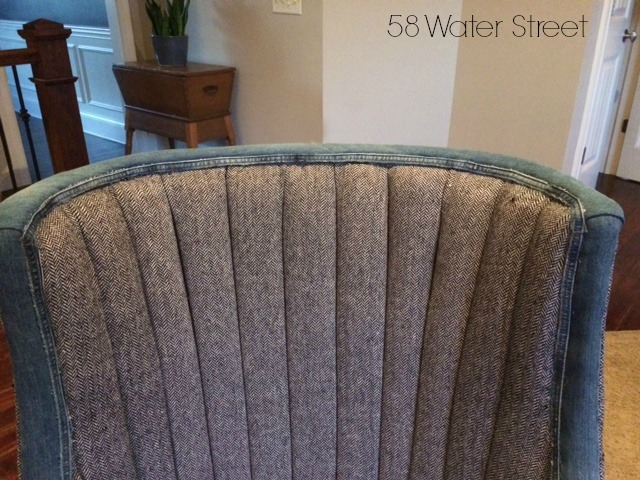 The previous upholstery job had only covered the channels with a large piece of material, so why couldn't I do the same? I pushed the herringbone fabric between each channel, pleating at the top and bottom, stapling in place. This fabric isn't going anywhere. Nice and crisp. 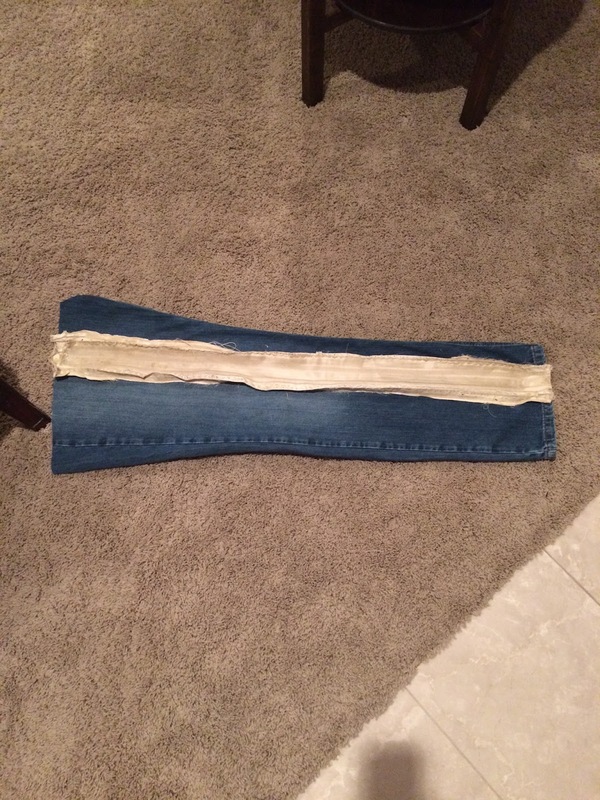 I picked up a pair of perfectly worn jeans at the Salvation Army for $2.00. I just wanted a hint of denim, nothing tacky, no pockets. 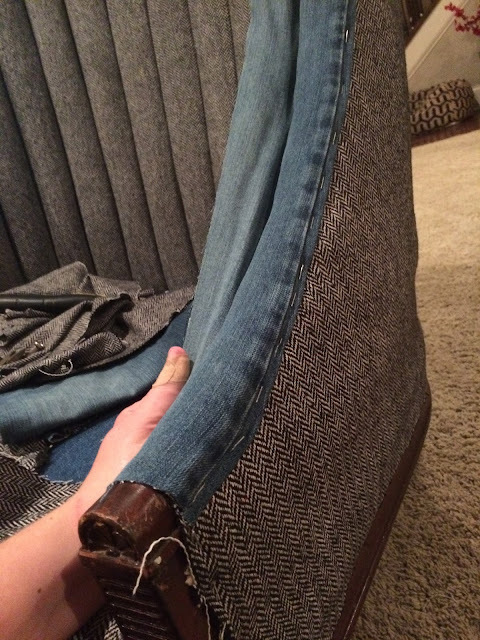 Using the upholstery as a pattern, I had just enough length in the legs of the jeans. 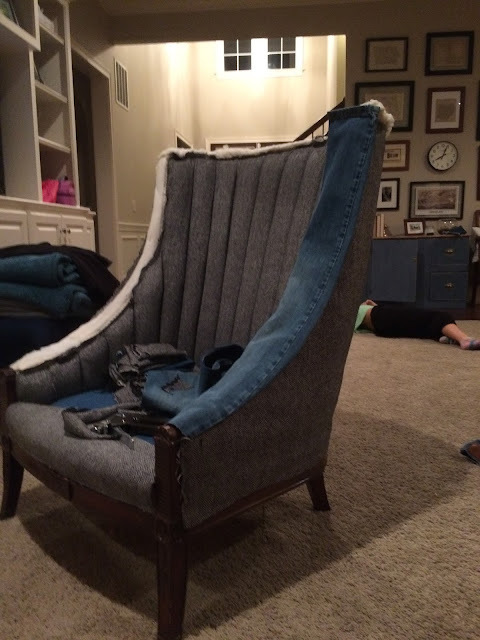 I only used denim in the area around the frame. 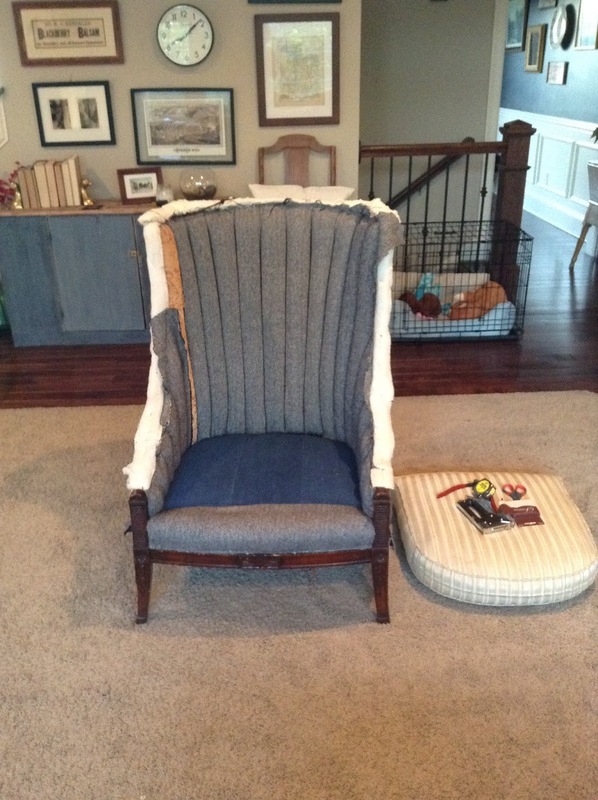 I cut the reinforced seams and used them for trim on the interior section of the chair. Now the most difficult part of the entire project...the part I had hoped to avoid: double welt piping. I used this tutorial by Dena at Hearts and Sharts as a guide. Dena is hilarious and helpful, two of my favorite qualities. And as it turns out, piping is not difficult at all. I love it so much, and I love the charm it adds in our living room. Bonus - super comfy! 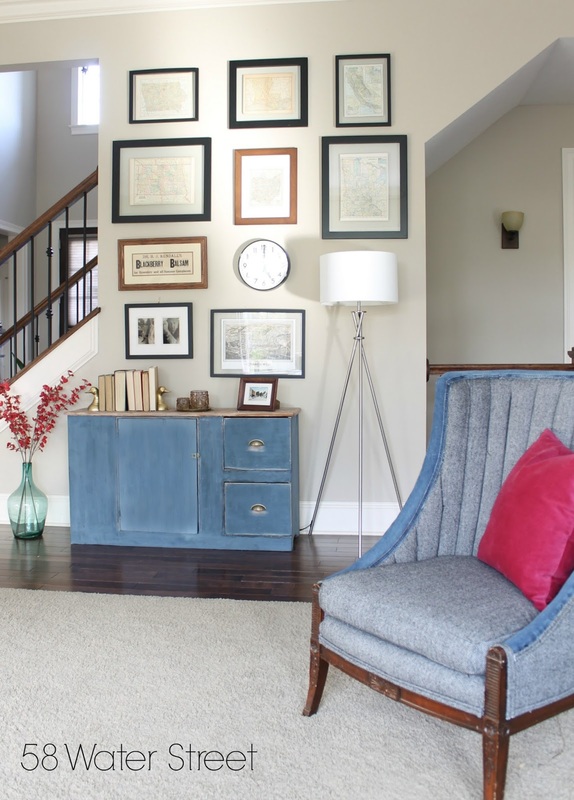 Now I'm on the prowl for an ottoman and side table to go with Mr. Intelligent Preppy Chair. The chair looks fanatastic! I love the combination of tweed and denim. Especially with your blue sideboard. Your chair turned out fabulous, great job! Oh my goodness! This chair is so pretty! I think you did a really great job! I love this Colleen! It looks so good. I'm gonna buy a channel back the next time I find one, you've inspired me.